We are in regular contact with families and others in the Greater Houston area who provide medical, rehabilitation, or educational services to those of special needs. Individual families also sign up for sailing excursions using the Registration link on this website. 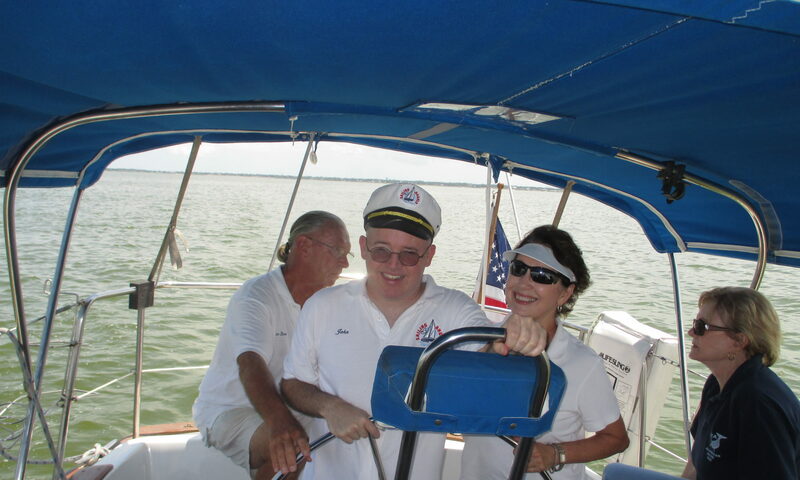 We then coordinate a sailing schedule with members of our Sailing Angels team. Sailing adventures depart from our berth in the Kemah area. The sailing, conducted throughout the year during daytime on weekdays & weekends, is about two and a half hours long. The child must be accompanied by his/her parent(s) or care giver and must be willing to wear a life preserver. Basically, the first half hour is a ‘getting to know you’ time during which we discuss things about the boat as well as safety items. When we leave the dock, the child helps steer the boat as we motor out to open water. The child also learns knot-tying, navigation and piloting of the sailboat along the way. Once the sails are raised by the child and Captain working together, the child begins to steer the boat under sail. The child, while at the helm steering the boat, is told that he/she is then the Captain (i.e. “the boss”) and, therefore, gets to wear my Captain’s hat. At the conclusion, the child is awarded a certificate as well as a large medallion on a ribbon which can be draped around his/her neck, similar to an Olympic medal. Most of our sailboats are very large: 35 – 45 feet long. Our team has provided this free service to more than 13,000 participants and we are extremely proud to note that we have a perfect (100%) Safety Record. Please see our Articles, Awards and Accolades by clicking here.